The Lacemaker's Y(e)arn is a visual conversation between two artists responding to the language of traditional lace construction. Karen Ostrom and Thessia Machado take as their point of departure the culture of Bahia, a state on the northeastern coast of Brazil traditionally known for its fishing villages and lacemaking. Their installation, The Lacemaker's Y(e)arn, is a unique collaboration integrating animation and sound, filtered through traditional lace and a deconstructed fax machine. With this project, the artists create a narrative that speaks of tradition, transition, and obsolescence, the handmade lace and netting mirrored by film and fax-machine technology. Karen Ostrom commissioned handmade bobbin lace from artisans in Bahia, and exposed these forms on photosensitive paper to make photograms and cyanotypes, created frame by frame. 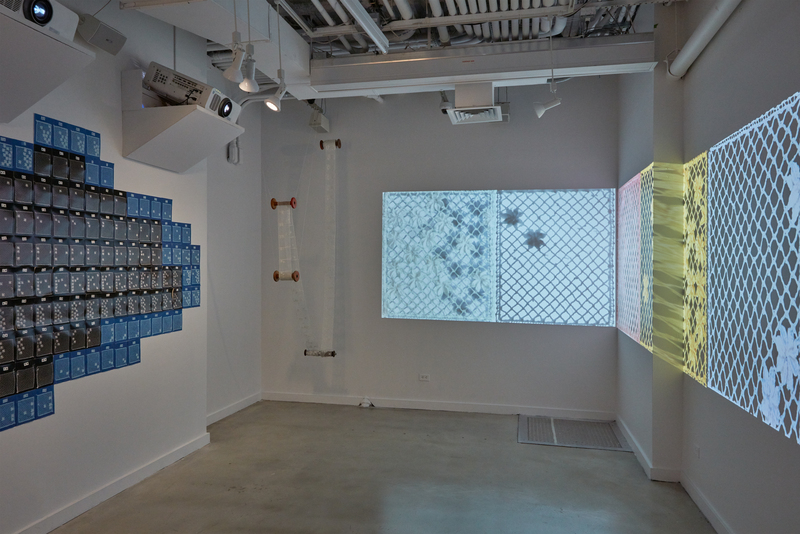 This sequence of images has been animated to produce large-scale video projections. The original lace frames and prints are hung and draped, giving the appearance of film rolls and contact sheets. Thessia Machado created a soundscape for the installation, evoking sounds of the ocean and of lacemaking through a repurposed fax machine run by Arduino microcontroller. In the installation a graphic score travels through a player piano-like device attached to the walls and triggers the sound modules with light patterns. Lace became an element in Ostrom’s work during a residency with the Instituto Sacatar in Bahia, Brazil in 2013, when she was invited to visit a local fishing village to further her research into local economies, social structures, and labors. The fishing net/lace relationship was clear both literally and metaphorically, but it wasn’t until the idea to commission the lacemakers to make each frame out of handmade bobbin lace and dig deeper into the economic exchange that this would create, was the piece anchored into its narrative and the relationship between the lace making, commercial fishing, and artistic production fully realized. Ostrom speaks of the necessity for the survival of the handmade by commissioning in numbers lace objects destined for a newly imagined purpose; a gesture indicating respect for tradition but also a significant nod towards the need for change. Machado’s practice centers on repurposing discarded and obsolete technologies into mechanical apparatuses that both generate and play sound. Machado chose the motor, gears and rollers from a discarded fax machine to advance a musical graphic score in the form of a looping scroll. The motion of the scroll, the timing of the light and wall-mounted, photo-sensitive sound modules are triggered as light shines through patterns cut into the scroll. The scroll and the blinking patterns of the light are controlled by a microcontroller, compressing the performative process and making the sound sources. Originally from Brazil, Machado’s field recordings of the lace making, the ocean, and original compositions sing in concert. The technologies are simultaneously digital and mechanical. Machado’s deconstructed fax machine, while still in the business of communication, is now transmitting information of a different sort that is both elaborate in construction and unified in its choreography of sound. Karen Ostrom’s work was awarded “Best In Show” in BRIC’s 2016 exhibition, OPEN (C)ALL: Up for Debate, which awarded her exhibition of her work in BRIC House. Karen Ostrom wishes to thank the following organizations and individuals for their support of this exhibition: Sacatar Foundation; Canada Council for the Arts; MacDowell Colony; Taylor van Horne & Mitch Loeb; Augusto Albuquerque; Scott Barton; Deise Sousa Dos Santos, Reilson Santos, Barbara Duarte, of ilha da Maré, Brazil; Matthew Burgess; Pat Oleszko; and Casa das Reinderas, of Saubara, Brazil.